the famous basilica that bears his name in Assisi. Before heading to a retreat with my spiritual teacher Cynthia in Scotland last summer, I took an excellent walking tour through the old city of Edinburgh where I came to appreciate the profound changes brought to society by the Protestant Reformation. The revolution in perspectives, values, and social impact were world-altering, and I felt unusually proud of my Protestant roots in the year celebrating the 500th anniversary of (my namesake) Martin Luther’s break from the Catholic Church. During that same tour, however, I also learned the disturbing truth that church attendance in Edinburgh has plummeted from 75% in 1900 to a paltry 3% today. This was a wake up call for me, which confirmed what I sensed in my classroom: traditional institutional Christianity is in freefall among many segments of modern society. While this may not be true in significant swathes of Africa and Asia, I consider it something of a crisis for religious communities in my particular niche of the world. And yet I find few people within the Church asking what seems so starkly obvious to me: why is the Christian faith failing to attract young people? This summer has brought me and my family to Italy with its long history of Christian origins and the Papacy; the Medicis and Barberinis; the giants of Western society such as Dante, Leonardo, Michelangelo, Machiavelli, and Galileo; and the saints Benedict and Francis as well as the present pope. What does a two-week survey of Rome, Assisi, Florence and Venice suggest about the task of revitalizing the spiritual lives of people? Let’s start with the most obvious problem evident on the trip. Even our cursory tour demonstrated that egoic intentions are rife in the history of the Italian church, what Tibetan teacher Chogyam Trungpa called “spiritual materialism” – using religious capital for earthly gain. The most concrete example of spiritual materialism came from Assisi. As explained in Spoto’s helpful biography about St. Francis, early in his adult life the young man received a mystical call at the church of San Damiano, “Francis, don’t you see that my house is being destroyed? Go, then, rebuild it for me (44)” Francis followed this vision literally and figuratively, repairing three churches in Assisi and attending to the physical and emotional needs of those in his local community. 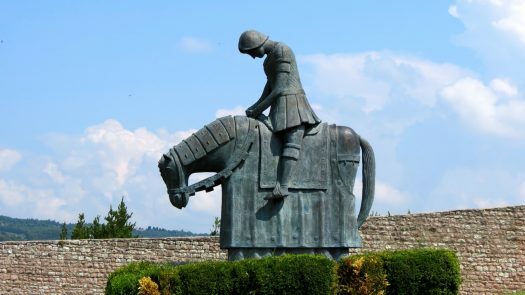 The son of a wealthy textile merchant, Francis famously stripped himself of his clothes and stood naked in the Assisi square, quietly renouncing the privileges of home and possessions. He “imagined that for the rest of his life he would be little more than a day laborer – a prospect of which he received the profoundest joy” (61). 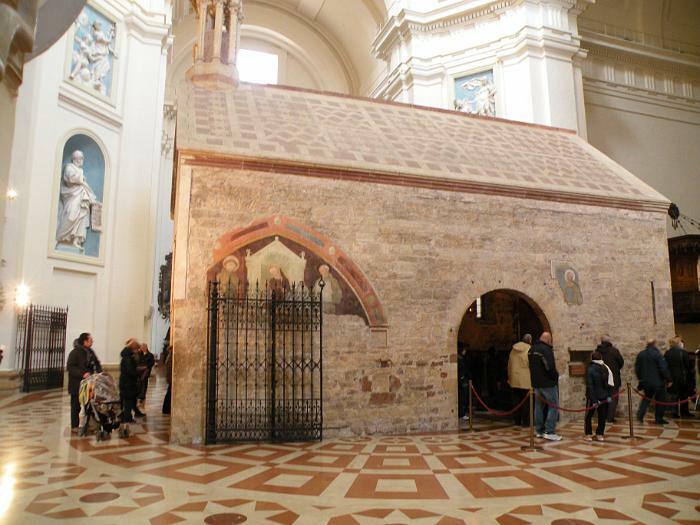 One of those churches that he repaired was a humble Romanesque church on the Assisi plain, reminiscent of Francis’ own cave retreats in the hills above the Umbrian town where he devoted himself to times of prayer, silent reflection and restoration. By contrast, the Papacy later built a soaring basilica – the 7th largest church in the world! – on top of and surrounding the humble earth-bound stone church, known today as Saint Mary of the Angels. Appropriating humility for the corporate brand! Perhaps most instructive to me was that Francis’ rejection of “spiritual materialism” included the legacy of his life’s work. While he did collect a small group of followers, he refused to write or to build for the future. Rather, he saw himself as a humble day laborer. Contrary to the saint’s wishes, the Pope later established the Franciscan Order, which carried his message within 75 years as far away as China. Yet for Francis, he considered such an outcome to be a dangerous development. 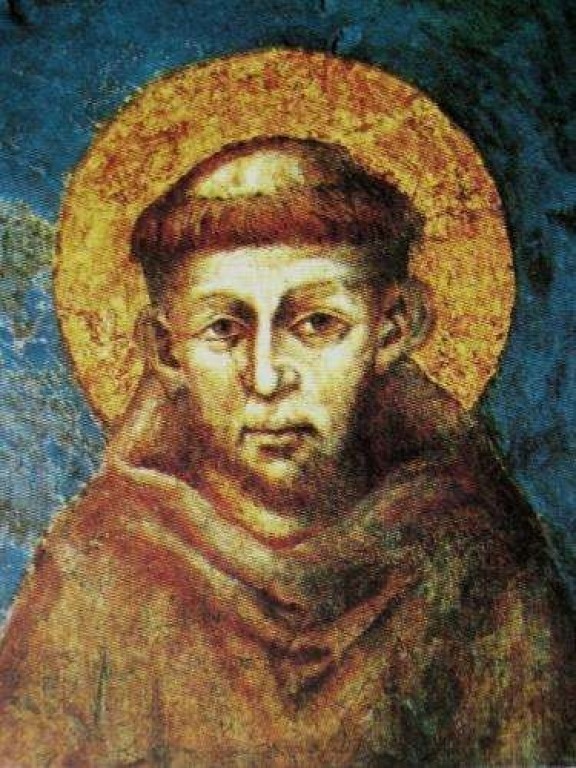 Regardless of the controversy surrounding St. Francis’ wishes, his early followers maintained a powerful testimony of their founder’s vision: “Like [Francis], each of the first Franciscans (as they came to be known) was ultimately a contemplative with a private and solitary life to which he returned almost as often as he undertook as a preacher and caregiver for the poor and sick…. [They combined] the contemplative’s dedication to prayer with the activist’s commitment to practical work on behalf of the needy” (72, 75). This striking yin-yang strategy reminds us of Christianity’s founder, as Cynthia explains: “Jesus was a contemplative, by which I mean that the intentional alternation between contemplation and action is one of the fundamental rhythms of his being . . . Finite action flows out of infinite spaciousness.” If we are to rebuild spiritual communities, an intentional alternation of contemplation and action – and their associated values of humility and compassion – is a non-negotiable for the followers of Jesus and St. Francis. The incarnation of these universal values in a 1st century Jew and a 12th century Umbrian cut figures so distinctive that they remain two of the most recognizable personas of the human family, which accounts for the large number of pilgrims that regularly stream to Israel and Assisi respectively. Self-emptying resulted in an unintended immortal legacy. which led to his creation of the influential Rule of St. Benedict. Two other characteristics of St. Francis seem noteworthy as we consider the question of revitalizing spiritual communities. 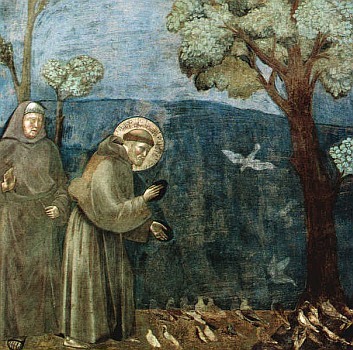 First, one of the most famous Giotto scenes from the San Francesco’s Basilica that adorns the city of Assisi is of Francis feeding and talking to birds, exhorting them to praise their Creator. “The accounts of Francis’ life are all filled with such moments: he frees a rabbit captured in a trap; he returns to the water some struggling fish trapped in nets; he asks the honey be supplied for bees in wintertime; he tames a killer wolf, turning the beast in to a town pet for the people of Gobbia” (100). Francis’ natural compassion for animals suggests a passionate love of the natural world which we can now extend to an unimaginably vast cosmos. 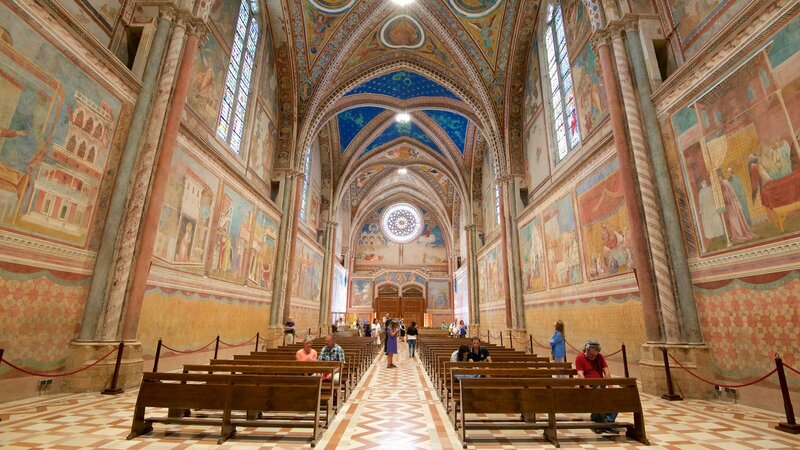 Upper Basilica of St. Francis’ church in Assisi which contains the famous Giotto scene of Francis preaching to the birds. Secondly, Francis willingly risked his life during the 5th crusade in 1219 by engaging in what we would call today “interfaith dialogue” with a Muslim sultan, al-Kamili. After sharing the story of Jesus with the sultan, al-Kamili’s advisors recommended decapitating Francis for trying to convert the leader. However, al-Kamil privately told Francis that this would be a great evil to condemn a sincere man who had risked his life for his religious ideals. Francis remained for a week in the “enemy’s camp,” the most significant outcome of which seemed to be Francis’ growing respect for his Muslim counterparts. The saint most associated with the phrase “make me an instrument of your peace” seemed buoyed by the great salaam teaching of a “rival” religion. In a world in which climate change and Muslim-Christian tensions are likely to be major concerns for the remainder of the 21st century, St. Francis’ life is an inspiring example of how to bring the spiritual imagination to bear upon contemporary issues. Our historical tour of Italy has shown that the normal lives of religious people were similar to the ways of the world: ambition, deceit, violence, and even large-scale death were everywhere in the story of the church. Yet a few individuals – St. Benedict, St. Francis, and the current Pope Francis – seemed to embody another set of values. In them the inner work of self-knowledge and the outer work of loving kindness spoke of a life manifesting – in their eyes – the Great Work of God. Engage in regular times of contemplation to nurture the inner life, which primarily means detaching egoic attachment from plans and projects, intellectual certainty and legacy concerns. Serve the poor and needy with compassion. Cultivate biophilia, or love of the cosmos. Dialogue for personal growth with those who hold alternative beliefs. In the end, it’s not a new message. Rather, the path of renunciation, compassion, cosmic delight, and world engagement are found in every tradition. For those of us who aim to share the best of the past with students in our classrooms, we need to reconsider our practice in light of these lessons from our spiritual forebearers. Merton, T. (1998). Contemplation in a World of Action, 2nd ed. University of Notre Dame Press, 160-161. Spoto, D. (2002). 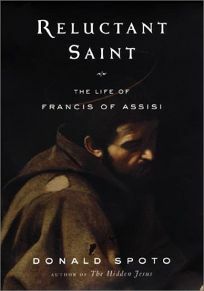 Reluctant saint: The life of Francis of Assisi. New York: Penguin. My first spiritual retreat with Cynthia was in Assisi in 2012, which you can read about here. This entry was posted in inner awakening and tagged Assisi, cynthia bourgeault, meditation. Bookmark the permalink.